AJP employed NAU branding elements to design dynamic axe-shaped surrounds that frame the LED displays. The NAU logo is prominently featured in the center of both end zones. Static vinyl printed banners serve as a colorful backdrop to tie the overall look, with “Welcome to 7000′” ceiling banners (308 feet by 6 feet) highlighting valued sponsors. 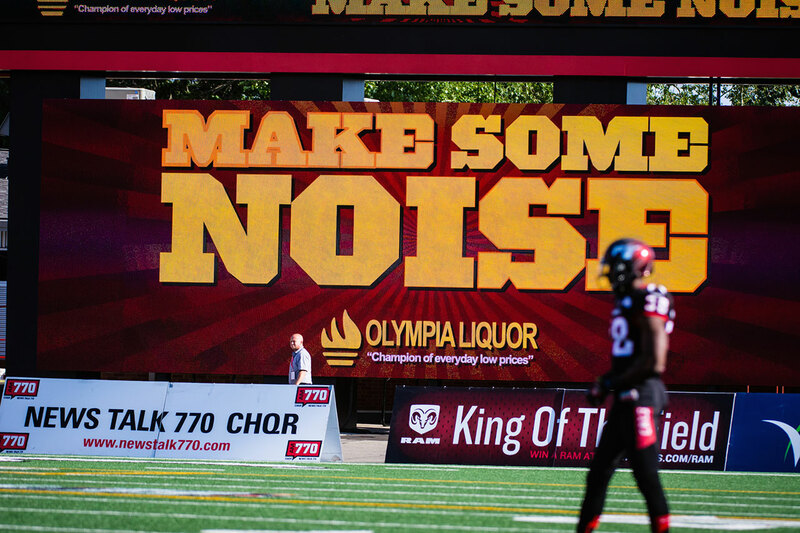 The North End Zone design features a high-definition, 10mm pitch LED display measuring 42 feet (wide) by 24 feet (high), as well as two auxiliary video displays for scoring information and messaging, each measuring at 24.4 feet (wide) by 13.4 feet (high). The South End Zone features two high-definition, 37.7 feet (wide) by 21.5 feet (high) with a central display for scoring and messaging at 37-foot (wide) by 11.5-foot (high). The West side press box was upgraded with a 15mm LED ribbon display that measures 85.4 feet (wide) by 3 feet (high). Other technology upgrades include new scoring controllers, locker room clocks and play clocks. FLAGSTAFF, ARIZONA – Northern Arizona University Athletics is proud to announce that brand new state-of-the-art video and scoreboards will be in place for the Lumberjacks’ home opener on Saturday, Sept. 8 vs. Eastern Washington. 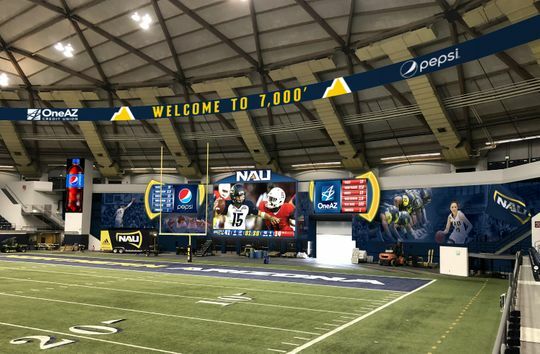 NAU Athletics partnered with Anthony James Partners for the design and Daktronics for the manufacture and installation of the new technology that will entertain fans at the J. Lawrence Walkup Skydome beginning this season. 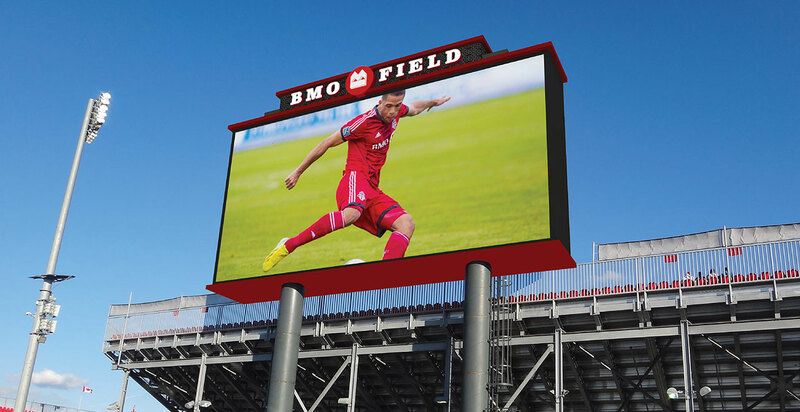 The upgrades will incorporate 10mm pitch LED displays with a high-definition output in the North End Zone that measures 42 feet (wide) by 24 feet (high). In addition, the North End Zone setup will include two auxiliary video displays for scoring information and messaging, with each measuring at 24.4 feet (wide) by 13.4 feet (high). The South End Zone will feature two large high-definition displays, each at 37.7 feet (wide) by 21.5 feet (high), as well as a 37-foot (wide) and 11.5-foot (high) central display for scoring and messaging. Branding elements were used to create dynamic NAU axe logo shaped surrounds to frame the LED displays, with an additional NAU identification logo proudly and prominently placed in the center of both end zones. Static vinyl printed banners serve as a colorful backdrop to tie the overall look, with “Welcome to 7000′” ceiling banners (308 feet by 6 feet) featuring valued sponsors. The west side press box was also upgraded with a 15mm LED ribbon display that measures 85.4 feet (wide) by 3 feet (high). Other technology upgrades include new scoring controllers, locker room clocks and play clocks. The display in the North End Zone will be installed and operational for Saturday’s NAU football home opener vs. Eastern Washington and the South End Zone component is expected to be ready for the Lumberjacks’ homecoming game on Saturday, Oct. 27 vs. Cal Poly. FLAGSTAFF, ARIZONA – The Northern Arizona University Walkup Skydome is currently receiving massive upgrades to its visual technology in the 41-year-old building. Mike Marlow, Northern Arizona vice president for intercollegiate athletics, announced the renovations in September and said the project would be completed by the football team’s Oct. 27 Homecoming game against Cal Poly. NAU Athletics confirmed to the Arizona Daily Sun that the cost of the upgrades currently totals $2,926,441.47 and stated in an email on Thursday that the final price could be lower considering athletics does not plan to use the $95,969.04 in contingency fees that are generally reserved for unforeseen risks or complications, potentially lowering the cost to about $2.8 million. The Skydome renovation is the first major financial project for Marlow since he took over as vice president for intercollegiate athletics in December 2017. Marlow was an integral part in the institution of the athletics fee — a $75-per-semester fee for students — the first of the kind for the university — that goes toward facilities, ongoing operations and programmatic services for NAU Athletics. According to NAU Athletics, the Skydome renovation is being partially funded by the athletics fee, which was approved by the Arizona Board of Regents in the spring and is estimated to bring in approximately $3.4 million annually but will rise as the school’s enrollment climbs. Randy Press, NAU Athletics assistant athletic director for communications, also said the rental of audio-visual equipment will no longer be needed for non-athletics events such as commencements. Two companies have been contracted for the project, one for design and consulting, and the other for the construction and manufacturing of equipment. Northern Arizona worked with Anthony James Partners for the design and Daktronics for the installation of what Anthony James Partners designed. Anthony James Partners has worked with major colleges and professional sports franchises including Washington State, where Marlow used to work as an associate athletics director. Daktronics has worked with Northern Arizona in the past to provide electronics for athletics facilities and received the contract for the Skydome project July 9, according to documents provided by Northern Arizona spokesperson Kim Ott on Thursday. The company accepted the contract July 10. “We are also looking forward to working with the student advisory committee for other uses of our video enhancements in the Skydome to better serve the university and Flagstaff population as a whole,” NAU Athletics said Tuesday. The finalization of the student advisory committee was announced Thursday, about three months after Daktronics was awarded the contract and three weeks before the project is expected to finish. The committee is comprised of six members, three of whom are student-athletes — a stipulation agreed upon when the advisory committee was proposed. The committee’s purpose is to work with athletics on using student funds, including the athletics fee, and how to make projects mutually beneficial for students and athletics. According to NAU Athletics, the committee is the first of its kind and that Northern Arizona is the only school that allows students to have input on how student fees are spent when it comes to athletics. In lieu of the student advisory committee, Press said NAU Athletics worked with other student leadership organizations when discussing the Skydome’s renovation project. Former ASNAU President and current Arizona Board of Regents student regent Lauren L’Ecuyer confirmed that the athletics department worked with ASNAU while the athletics fee was in its infancy this past spring semester and that she recalled the Skydome renovation had been brought up in forums and other meetings. L’Ecuyer said the advisory committee took more time than anticipated because athletics did not receive as many applications from students as initially expected. The lack of applications for the advisory committee parallels the massive opposition the athletic fee received from the student population while NAU Athletics held forums during the 2018 spring semester. “The real allocation of funds that the students will be involved in is going to be for next year,” L’Ecuyer said on how the advisory committee will work going forward. All numbers pertaining to the project are from a financial workbook that NAU Athletics provided. Three video displays have been built at the end of the north end zone and the south end zone is set to receive three as well, but is still under construction. The two combined equal $1.8 million, about half the total cost. The end zone walls are also being painted. There was a plan to paint the exposed air ducts but it recently fell through due to a rise in cost. Additionally, there is a new scoring system in place — which itself includes scoring controllers, locker room clocks and play clocks totaling $30,000 — and $88,500.00 in design and consulting fees. The press box received a new display that cost $193,425.37. Press said the scoreboards at both end zones were 16 years old and Daktronics was not able to provide any replacement parts. 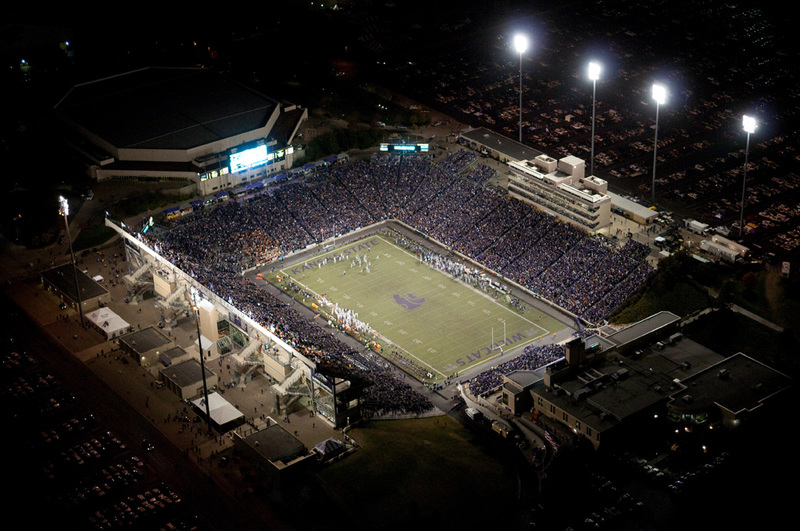 “According to Daktronics, the company that manufactured and installed both the new and previous scoreboard/video board, no replacement parts are available for the scoreboard that is being replaced, meaning if we had any technical failure the unit would have to be shut down and would not be able to be utilized without being replaced,” Press said in an email on Thursday.